Dynamic, exploratory, and emergent। That describes the productive session we had today. Sylvia requested feedback on her upcoming ethnographic presentation at the Society for Applied Anthropology. Clarence and David were in sync - bouncing ideas off of each other, productively helping Sylvia re-conceptualize her paper. 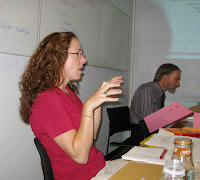 Elizabeth provided a developmental perspective to the conversation. She helped capture the sense of "going against the tide" and changing professional culture in medical school. Gabe crystallized the imagery with the recommendation that the intervention be characterized as an "injection of humanism." It was a extraordinarily generative session. 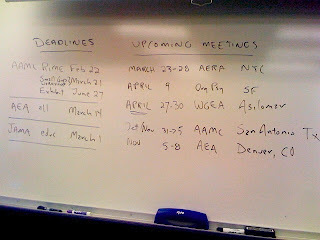 Stanford Medical Education Research Group - Room Schedule. We will be meeting in our regular Redwood Bld 138B this Thursday 3/20. Sylvia will be sharing her ethnographic proposal with us. Take care and welcome to spring quarter. There were a large number of acceptances (posters, oral presentations, and panels) concerning the upcoming WGEA conference in Asilomar. They will be listed on the blog in the next couple of weeks. Welcome to 2008! 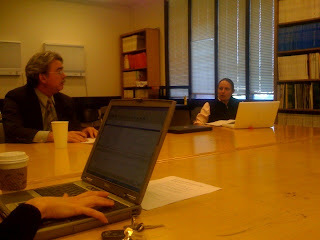 Yohko Murakami presented the Stanford University Minority Medical Alliance Conference Survey to the group. The group provided constructive feedback in a timely manner. The survey was revised based on the input and deployed. The discussion was animated. Drs. Gabriel Garcia and Kenneth Vosti provided instrumental insights. We agreed to keep as many of our meetings as open as possible to facilitate discussion and exploration and maintain our informal learning atmosphere. However, our next meetings will include talks from statisticians and related research methodologists. 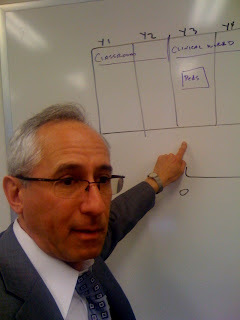 Dr. David Irby, UCSF, has agreed to speak to the group in April. Happy Holidays! As we bring another year to a close, it is important to reflect on our accomplishments. We have generated new research ideas, provided constructive, collegial feedback, and presented papers and workshops at professional meetings, including the Association of American Medical Colleges and the American Evaluation Association. We have invited speakers, including the editor of MedEdPortal. Many of us have published our work in various journals and books during the year and have plans to continue our scholarly efforts into the next year. Mostly, however, we have built a vibrant research group and look forward to starting up again in the new year. Guest Presenter James Priest. The focus of this weeks session was on a study of rounds. The study will be conducted at Stanford and the University of Washington. 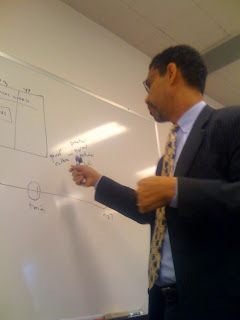 James presented a clear picture of his planned study. Medical education research and evaluation members provided a useful critique. Neil helped identify critical variables to consider. Clarence recommended a formula for analyzing the data. The second half of the session focused on the introduction of new survey questions for the quarterly e*Value course evaluations. A few of the added questions focus on attendance and stress. These questions have implications for the design and implementation of the curriculum. The decision to change the existing survey had philosophical implications. There are two philosophical camps associated with changes in evaluation machinery (survey questions): the traditionalists and modernist. The traditionalist holds on to the past because it has worked. There is merit in this position because it ensures that the same questions are posed over time - allowing us to track change over time. The modernist understands the importance of changing existing traditions or survey questions to reflect changes in the curriculum. The modernist keeps the evaluation system alive and relevant to stakeholders. The current philosophical position adopted is a combination of both traditions - keeping most of the key questions to allow for long term comparisons, asking some questions annually instead of quarterly (since they were not high yield questions), and replace some questions with completely new ones to reflect current changes and test current questions. The session like most was engaging and productive. AAMC Presentation. Neil, Jen, and David presented their mini-workshop for the Association of American Medical Colleges' presentation. It is titled, Empowerment Evaluation: A Collaborative Model for Evaluating Medical School Curriculum and Enaging Accreditation Standards. The opportunity to practice this workshop was invaluable. The group provided useful advice, ranging from trimming down the student comments in the package to adding more detail about the "limbs on the evaluation tree." 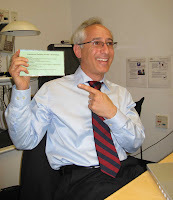 The laminated cards, highlighting the empowerment evaluation concepts we want workshop participants to use, were a "hit." We are all getting close the actual conference presentations at the AAMC and also at the American Evaluation Association, thus the marathon of mock presentations to prepare for the actual events in early November (November 2-7 at AAMC and November 7-11 at AEA).